This entry was posted in "Facing a Dying Nation", Bob Nichols - Project Censored Award Winner - Veterans Today Columnist - and frequent contributor to various online publications, MILLION A WEEK CLUB, MILLION A WEEK CLUB No 4 – What US Cities are in it?, Nichols on Nuclear, Nuclear War, Nuke Ignorance Busters, On the Road to Extinction - WHEN HAPPENED, Table of Poisoned American Cities - Total Gamma Radiation and tagged "Where's the BETA? ", #DodgeRadsNow #DodgeRadSnow #DodgeTheRads, MILLION A WEEK CLUB No 4 - What US Cities are in it? 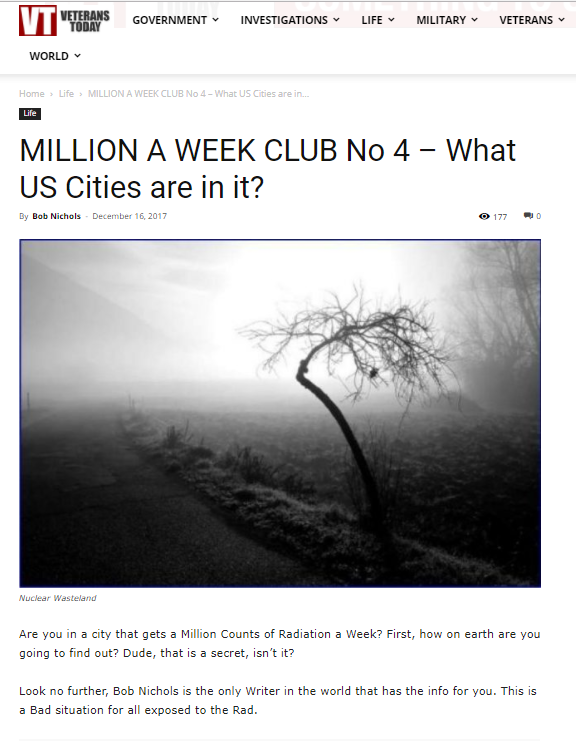 Mapped and Charted, MILLION A WEEK CLUB TOTAL GAMMA RAD USA, Table of Poisoned American Cities - Million a Week Club, WE ARE THE MEDIA NOW, Your Radiation This Week - YouTube. Bookmark the permalink. ← MILLION A WEEK CLUB – The Bad Stuff No 3 – WHERE’S THE BETA!? !